Intermittent fasting (IF), effects differ in females VS males. 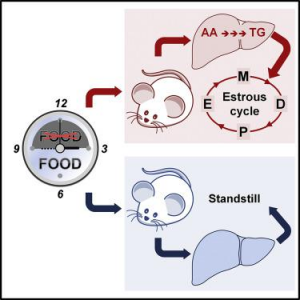 New study: Short IF in females causes fat synthesis in the liver using amino acids & proteins, opposite to males. Implications include gender-specific therapeutics for metabolic conditions, hormonal health, body composition, detoxification, fitness, performance. Does Liver gender differentiation exist? Yes, it is set by pituitary hormones in newborns & aromatase-dependent conversion of testosterone into estradiol, which increases ERα (estrogen receptor alpha) in the liver and thus ‘masculinization’. Amino acids were also shown to activate liver production of ERα, and thus with estrogen, regulate hormones & metabolism. Yes this was a mouse study, and human studies are necessary, but mammals share a common evolution over 100million years that maximize reproductive capacity and nutrient dense storage in females. Are you interested in optimizing your nutrition and performance?